When it comes to evaluating prospecting display campaigns, most digital marketers are familiar with the question, “When’s the last time you clicked on a display ad?” Essentially what this question means is, marketers should no longer be evaluating their display efforts through the lens of last click attribution. If you are seeking to grow via upper funnel channels like display or video, evaluating success with a last click mindset devalues the impact prospecting tactics have on your full-funnel digital marketing strategy. In most cases, it is not enough to convince a new prospect to become a customer by having them see and click on just a single ad. Think about the last time you made a larger purchase, like a new car, or a time your company decided to invest in a new software. It often takes multiple touchpoints to help drive a purchase, especially if your sales cycle is longer than a few days. Knowing all of this, how else should you evaluate upper funnel prospecting to justify digital ad investment? In this post, we’ll walk through a few different examples of how you can evaluate the success of your prospecting campaigns. There is no one right way to do this, but any of these options are better than only evaluating last click attribution on display. After you launch a large new display effort, you should check if you are seeing shifts in branded search volume. An uptick in branded campaign traffic after a new display campaign launch would indicate that you are generating enough interest for that audience to start searching your brand name on search engines. It’s not uncommon for this to take a few weeks before you start seeing results. These brand search volume spikes can have a strong impact on your bottom line, especially considering how valuable brand traffic is. In one instance, we saw a 28% lift in brand traffic after we launched a new display campaign based on vertical-specific keyword targeting. This uptick in brand searches after the new display strategy launch indicated to us that we were targeting a valuable audience and generating brand interest. Brand conversion growth is one the most enticing display evaluation tactics out there. We know that brand site traffic is incredibly valuable for every advertiser. In most cases, it’s the top performing keyword segment for your business on search. We typically expect brand conversions to be among the most valuable for any advertiser. So identifying and benchmarking consistent brand conversion lift is another way we can evaluate prospecting display efforts. 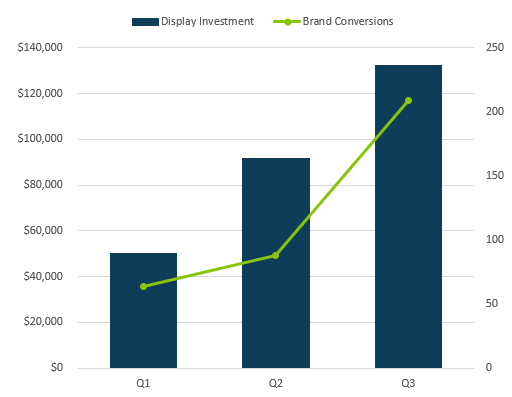 For one advertiser, as we scaled a full-funnel display strategy, we saw subsequent brand conversion growth, which allowed us to further justify display investment. 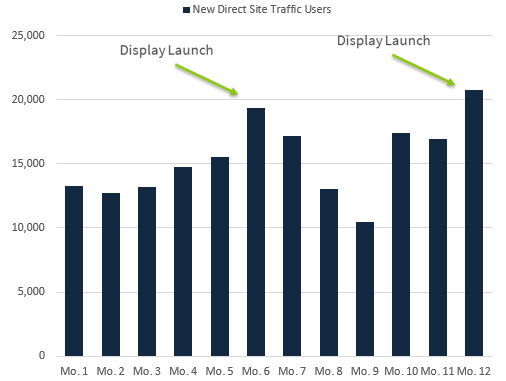 Another metric to evaluate for a prospecting display campaign is growth in direct site traffic. 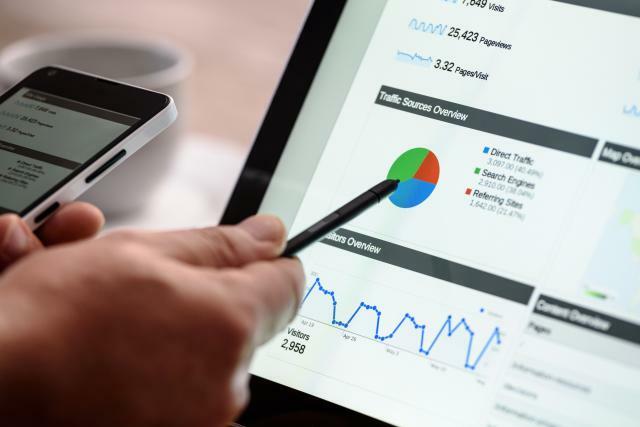 Using a website analytics platform, like Google Analytics, you could evaluate growth in direct site traffic after display campaigns are launched as a measuring stick for performance. If a user sees your display ad for the first time, and one of the following actions they take online is directly typing in your brand’s URL, this again would indicate that you’ve reached an engaged user and that the display targeting is working to grow your brand. 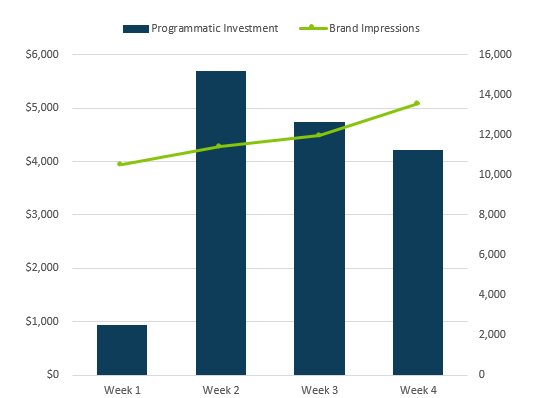 In one test case for an advertiser, we saw all-time-highs in new users during a display launch that targeted a lookalike audience for previous site converters. There is no end-all-be-all solution to prospecting display measurement. But long gone are the days when digital advertisers can simply evaluate their campaigns through last-click attribution. By incorporating one or more of these measurement strategies into your next display launch, you will be able to optimize towards brand awareness, grow your sales funnel, and increase your business’s revenue. Looking for more in-depth help on upper-funnel prospecting strategy? Contact our team.